Ahhh weddings stationery. 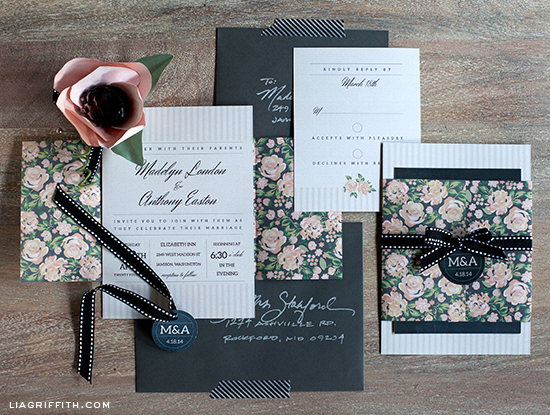 As I have mentioned before, for three years before I began blogging full-time, I was a creative director for a stationery company specializing in weddings. When Made in Paper magazine asked me to do a creative wedding invitation project, I went right back to what I know, and of course I had to design an editable invitation and response card. It took a little bit of finessing but these pieces are ready for you to open in Adobe Acrobat and add your own information. The added touch comes in the form of the vintage paper wrap, finished with a pretty ribbon and monogram tag. 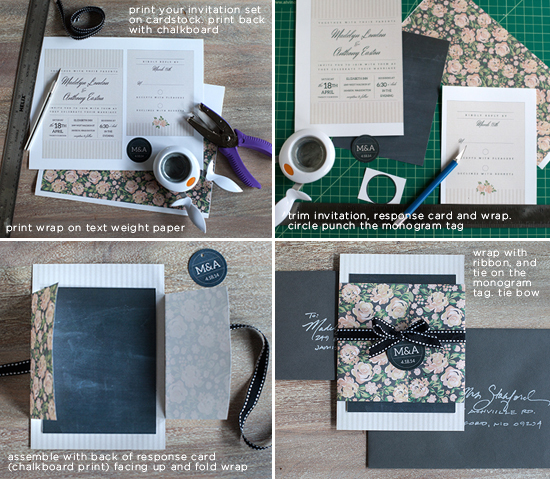 To begin your DIY invitations you will need to download the free fonts Aleo and Herr Von Muellerhoff. Install these onto your computer. Download the invitation PDF onto your computer and open in Adobe Acrobat. 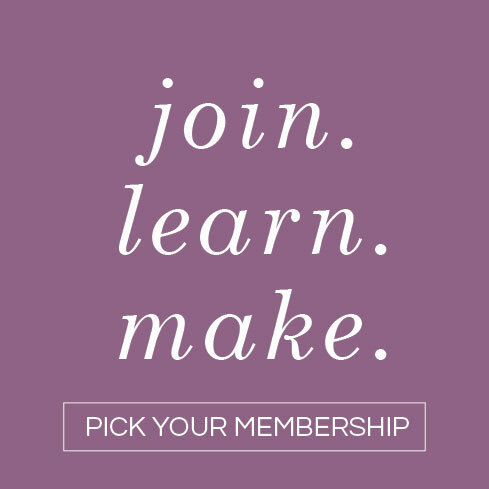 Click over the place holder text and type in your own on the invitation, response card and monogram tag. Once done you can then print these onto a card stock. I highly recommend having these printed with a laser printer. 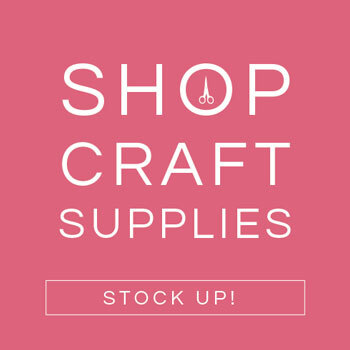 You can take them to a FedEx Office or an office supply store that offers this service. To add a little interest I included a charcoal chalkboard second page that you can print onto the back. The floral paper wrap works best when printed onto text weight paper for easy folding. Once printed just trim all pieces using a 1.5 inch circle punch and a small hole punch to trim the monogram tags. These are ready to assemble. I used A7 and A6 envelopes in Slate that I purchased from Paper Source with a silver pen for the addressing. Though this set as shown here is gratis. i was wondering if all the text can be edited? i would like to turn the wedding invitation to an engagement invitation, but it would require me to edit the text, would this be possible once i download? Hi Amanda, thanks for getting in touch. Unfortunately the only text that is editable are the personal details. 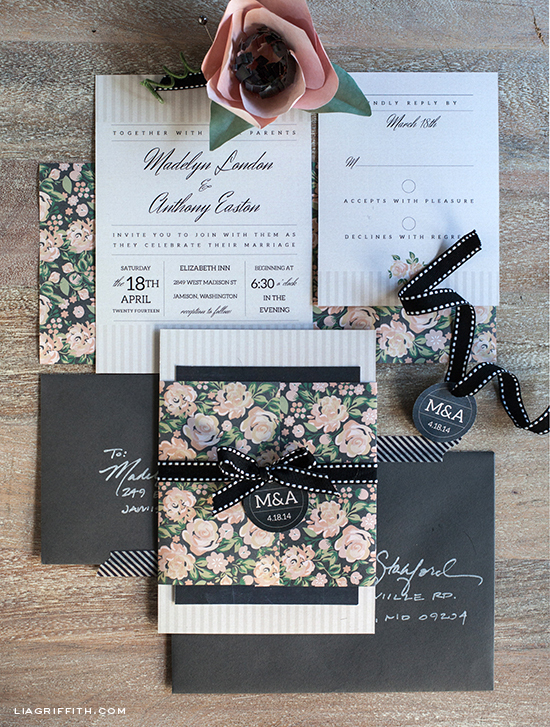 We do have an engagement card in black and gold if that interests you and we plan to create an engagement set in a similar color palette to this blush and charcoal set very soon – watch this space! I am having some trouble with the font download, directs me to a blank page with an error. Could you give me the direct link for it? We used a brand called Neenah but any white cardstock should work. We used a brand called Neenah but any white cardstock should be fine. Hi Lia! I am in LOVE with these invitations. Although I am running into some issues when printing… The word PLEASURE appears bold and the WIT in Declines with regret is also bold. Any ideas on how to fix this? Also the gentleman at FedEx office said it may look better in Jpeg format. What is your opinion on that? Congratulations on your upcoming wedding? It looks fine on our end, it is a non-editable field so it should change. Does it appear bold when you print as well? Because the font is pixeld based on the screen rather than print based it might appear different on your screen. We print from pdf not jpeg all the time. But you could try both options and see what you prefer. Sorry, we only created what you see. Congratulations on your upcoming wedding! These are beautiful! I’d like to inquire if you are selling the same paper design in your invitation? I’m willing to buy them to add to the beautiful template of yours for my friends’ wedding. I LOVE these invitations! They fit my theme perfectly. However, I recently lost my parents and it doesnt feel right to say “together with their parents”, Is it possible to say “together with their families”? Hi, I am getting married at the end of the year and I am loving your blog! It has some amazing DIY projects that I love especially the ones where you can just print them off! 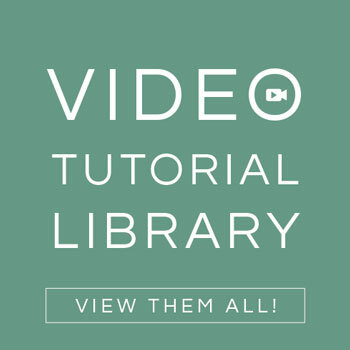 I am so lucky to have found your site for some inspiration. I am hoping you will be doing more Pink and Gold themed wedding Projects/DIY. I am designing a wedding that is taking place this fall and it is blush pink. I am mixing in some gold elements like the eat cake and Mr. & Mrs. glitter signs. I LOVE gold and pink together. Hi Lia, I absolutely love this invitation set! I was just wondering though, when I go to print out the invitations can I show them a copyright of some kind. I think if you show them the post showing that I am sharing this as a freebie for personal use, they should be fine with that. Hi Lia, I want to print these out but I am worried that they won’t give them to me without a copyright paper stating that you have given these for us to print out. Is there a way you could help me with that? Can you show them my post stating these are acceptable for personal use? That should do the trick. I was able to open the invitations but when I put in our date of September 5th, The word Septmeber is too big and comes out cut off when printed… what can i do?? It is difficult to design something with so many variables for sure. Shoot me an email at lia@liagriffith.com and we can figure it out. I had the same problem that Karin had. Both on the screen and when being printed, the font is being cut off on our names and then on the date on the reply card. I have downloaded and fonts and done several tests and still have the same problem…. it the size of the font controllable at all? Thanks for your help! Sadly, the Adobe Acrobat is a bit limits so these freebies may not be the best fit for everyone. Send me an email at lia@liagriffith.com and we can see if we can trouble shoot. Hello! I am trying to access the printable pdf, but my computer won’t load them for some reason. Do you know how I can fix this? Thanks! Double check that you don’t have a pop up block. Or if it opens a window and you see nothing, give it a minute to load. Once it is there you can download using the button at the top right. I just purchased your invitation for my wedding in August! How do I contact you about customization? Thanks for your beautiful work! I sent you a message on Etsy about your customization. Yay! it’s so beautiful thank you! I have one question if I download the image my tekst is going up half a cm. how can I fix this? Did you download the font first? If so, sometimes things look different on the monitor than when you print them. Do a test print and see if it is still that is shifted. You have such an excellent taste. I am simply amazed by your work! I would love to use so many of your templates, but unfortunately there are often some non editable english passages in them, which I can’t use, because I live in Germany. I would be so grateful, if you also could offer editable templates for the non-english speaking out there. Thanks Anette. Hum, yes, you are right about that. A lot of my printables, like the Christmas ones, include text that is designed so it is not editable. This one has the letter spacing which can’t be editable, but I can do a custom version for anyone too. THANK YOU for being so GENEROUS to share your fabulous work with us. Greatly appreciated! You are so welcome Susanne! I am loving these colors too. Maybe my next bedroom redo? Christmas gift wrap, and so did the receivers! Thank you ever so much for sharing your creativity! So sorry. Fixed. 🙂 This is just a wrap for the invitation, but I will be developing a line of spring gift wrap and will include this design as well. Stay tuned. Do you recommend white or ivory card stock? I hope to make them! I used white since the image prints the linen texture.